Forget about Indian food and soap operas. Roll up your sleeves, and get ready to taste success and smell the coffee in the Russian market, says Sandeep Garg, an entrepreneur from New Delhi who has set up a thriving food business in Russia. RIR caught up with Garg, who now sees the freezing Siberia as a second home. How did you end up in Russia? After leaving school in 1987, I tried to get into the Math department, but fell two points short of the passing mark. I stumbled upon a newspaper advertisement which invited anyone interested to study Russian. At the time all my peers were studying Spanish, French and German, but I wanted something different. After two years of studying Russian, I received an offer to study in Moscow to become an engineer. I agreed. Why did you decide to stay in Russia? After I finished my education in 1996 I was about to go back to India, but a friend in Moscow invited me to go and work with him in Krasnoyarsk, Siberia. We went there and ended up staying there. I witnessed all the hardships that took place in the development of Russia’s market economy in the 1990s. It was tough at first. Krasnoyarsk was different from Moscow; people were less forthcoming. I tried several companies and occupations. I did medicine and sold Indian goods before going into the tea business. What do you think are problems that a businessman in Russia faces, but not in India? It depends on how you build your business. In both countries you need to be aggressive. In both countries people dread the taxman. Not all people in Russia understand how to do business properly. Many of them, after listening to the radio, think that business is about investing money and reaping the rewards. There are no long-term businesses. Seventy per cent are one-off projects. I have survived in this market because I am against these types of projects. Is it difficult to find a niche in the Russian market? The market is not overcrowded yet. There are a lot of holes that can be patched up. I, for one, do not only supply products, but do some consulting as well. I became a member of the European Coffee Association six months ago. In addition to selling coffee, I teach people how to serve tea or coffee. 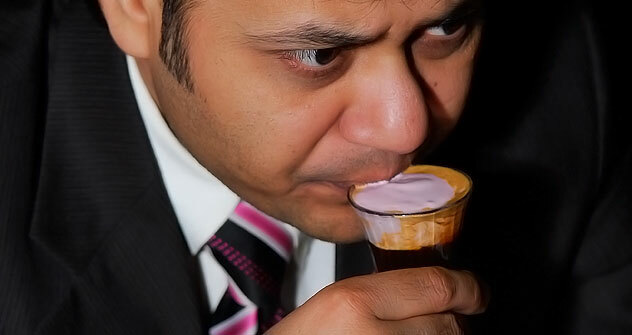 Many new restaurateurs buy good coffee, but do not know how to make it and serve it properly. I go to them and explain things. Some heed my advice. There are people in the Russian market who trust professionals, if they do not understand something. Most people in Russia think that that good coffee comes from Latin America and Africa, while India is associated with tea. There is Indian coffee in Russia and it is good coffee; it is mainly sold in the “hotel-restaurant-cafe” segment. It is part of a mix. It is hard to say how much Indian coffee is sold in Russia, but the bulk of it is sold in Moscow. I hope we will be able to think of ways to deliver coffee to Krasnoyarsk directly from India. The company has bought five hectares of land and is building warehouses. We are planning to open a boutique that will sell Indian coffee, tea and spices. What would be your five suggestions to a young Indian who wants to come to Russia and set up a business here? First, don’t cheat your partners. If he promises a certain quality level, let him deliver it. As an Indian myself, I can say that Indian partners may ship some quality goods in one instance, but then turn around and throw in some shoddy stuff in some other shipments. Second, forget about the Indian food. All the Indians who come here complain that they cannot get Indian breads, beans, soup and rice. You have to adjust to the culture you live in. Third, forget the soap operas you were watching back home. You won’t get them here. Fourth, never be late. When you are late, your partner thinks ill of you. There are people in Russia who would think nothing of throwing you out of a meeting if you are one minute late. I respect such people. Fifth, if you have cut a deal, stick to it. That is the main thing. I always try to do it. He, who has not managed to make money in Russia, won’t make money anywhere. Not that it is easier here, but you have all the tools at your disposal in Russia. In the West, you report to work at 10 am and move out at six in the evening. They pay you your wages. There is no drive involved. My sister lives in Germany. Her husband comes home from work and watches television. When they wanted to have a second child, the government told them ‘No’, and that they have to move to another flat. If you have no money, borrow from us. Everything is regulated there. Here, you come to work in the morning, have a spat and things get all wound up. I am engaged. My fiancé is a Russian. We have already had an Indian wedding. We are going to have a Russian wedding in April or May. What are your future plans in Russia? Are you going to stay here? I’ve lived here since 1989 and it is not like, I think, I’ll work here for five more years and leave. I want to buy land and a flat. We recently went to look at a plot of land, but it is too far away, 45 km from Krasnoyarsk. Do you have time to study Russian culture and go to theatres? I have no time for theatres at present. As for music, I like the Russian singer Valery Meladze. I am not just his fan, I live by his music. I have CDs and cassettes and I don’t miss any of his concerts. If I go on business to a city and he gives a concert there, I make it a point to go and see it.